SMILE 4G network has introduced a new offer that gives customers who buy its Smifi device or Router starter pack a whopping 7GB data and 100% data bonus everytime. Smile is a 4G LTE network service provider in Nigeria with an unlimited monthly plan which goes for N19,800. It has a wider coverage in some Nigerian cities such as Lagos, Abuja, Port-Harcourt and Enugu. It’s still spreading its coverage to other states and remote areas in the country. Smile is popular for its fast and reliable internet connection. Now you have another cheap data offer that gives you 7GB + 100% double data bonus when you purchase any data plan. 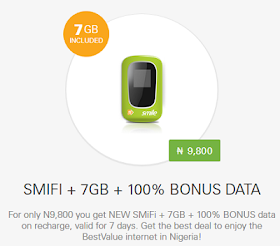 To activate this SMILE 7GB data offer, you must buy the Smifi device which costs N9,800 (Naira). Alternatively, you can get the offer by buying a new router starter pack. You will also enjoy 100% data bonus which runs till three months. Also, you will get free unlimited on net calls and 10 minutes off net calls. Once activated, there is no restrictions or limitations to what you can do with the data as you are allowed to browse any website of your choice, use social media platforms, stream videos and lots more. Remember, this SMiFi offer is available in all cities where SMILE network is operational. Do you think this is a welcome development?